Arthur Karter was raised in a wonderful Fairlawn, New Jersey family that was dedicated to Jewish continuity. The family was in the furniture business, and Arthur worked long hours, learning the importance of diligence and hard work. Arthur found Chabad as many do, searching for a place at the Pesach Seder. Invited by Rabbi Levi Neubort, Arthur spent the first night of Pesach among his fellow Jews and was instantly inspired by the vibrancy of the community. Arthur spent the evening drinking the four cups of wine, and joyously sharing the story of the exodus. That night became a turning point in Arthur’s life. Taken in by the warmth of Chabad and later by his deepening friendship with Rabbi Neubort and family, a new chapter was forged. Arthur found a community rooted in tradition while welcoming Jews from all walks of life. After attending various Chabad programs, Arthur found a place for himself and a connection to his Jewish roots. After all Chabad had given him, the next step in Arthur’s journey was to give back. Arthur’s Planned Gift to Chabad has blossomed into a wonderful new preschool building and a warm Jewish home for all ages of the community. 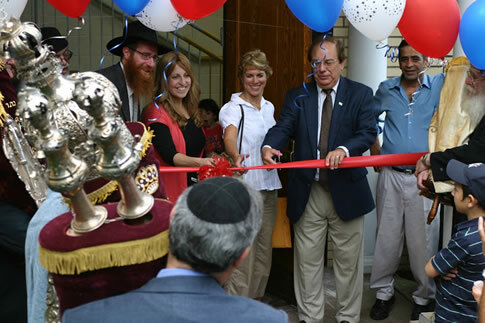 Arthur Karter’s lasting Jewish legacy shines brightly in Fairlawn New Jersey.